How humans perceive a fence compared to a horse. Equine vision research has led to a recommendation to change the colours of jumps on racecourses in Britain. Presently, the colour used on hurdle frames and fence take-off boards and guard-rails is orange, based on human vision. However, horses have reduced colour vision compared to humans, and only differentiate objects in a palette of blues and yellows. The new research led by the University of Exeter shows that other colours should be more effective in offering visibility to horses. 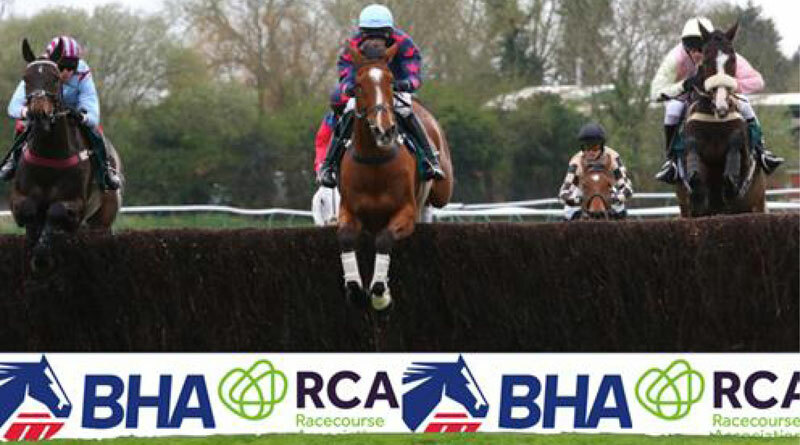 The study was commissioned and funded by the British Horseracing Authority (BHA) and Racing Foundation, leading on from the partnership between the BHA and RSPCA, which work together to develop new ways to make hurdle and fence design safer. The research was undertaken by Dr Sarah Paul and Professor Martin Stevens, aiming to improve obstacle visibility for horses and thus reduce the risk of falls and injuries. They have recommended to the sport’s Racecourse Committee that a phased trial be carried out using fluorescent yellow for all hurdles and guard-rails, and fluorescent white for take-off boards at fences. These colours have been determined to maximise visibility under a wide range of conditions for both humans and horses. The proposed new obstacle colours that will be trialed at training grounds, following research by the University of Exeter that shows horses see better and may jump differently over white and yellow obstacles compared to the orange currently used. The research phase of the project included testing the visibility of orange markers and other potential colours at 11 racecourses, and in collaboration with trainer Richard Phillips, testing the behavioural responses of horses to more prominent colours in a controlled environment. Retired jockey Ian Popham and conditional jockey Danny Hiskett rode the horses throughout the trial. More trials will take place at training grounds in order to build up a significant dataset before rolling the trial out to a live racing environment. The results of this research will be shared with other racing jurisdictions and equine organisations. How humans perceive the proposed yellow colour compared to a horse. David Sykes, Director of Equine Health and Welfare for the BHA, said time would be taken on the project. “As with the ongoing phased introduction of our padded hurdles – which have proven to reduce faller and injury rate … the evidence of the ongoing trials continue to support the case for change. The faller rate in British racing has reduced by 29% since 2004 as a result of investment in racecourse safety, and constant enhancements in racehorse care and training standards. The research has been applauded by the Racecourse Association and the National Trainers Federation.